Congratulations to the winner of the grant –Tappan Middle School (Ann Arbor, MI), the 4 finalists, and everyone who applied for the grant this year. We received over 150 amazing applications from across the country which demonstrates just how impactful gardening can be on the lives of students and their communities. Read about the winning project and view the garden projects of the finalists on GEF’s website. The four finalists will each receive children’s gardening books, reusable shopping bags, seed packets and other assorted prizes. The winner will receive a $1,000 check for their outstanding effort. Tappan Middle School will use the funds from the grant in several ways, including recruiting and training 8th grade student to visit 6-7 grade classes to highlight the garden and after school club as well as purchasing supplies for seedling distribution and after school sale. 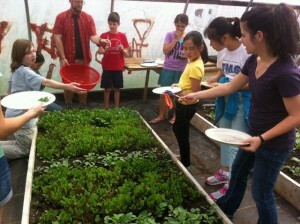 The Green Thumb Challenge Grant is an annual contest for school and youth gardens across the nation. The award is designed to support the continued sustainability of an exceptional youth garden program that has demonstrated success, and has impacted the lives of kids and their community. Since 2004 the Agrarian Adventure has brought together teachers, community members, and parents to serve the students at Tappan Middle School in Ann Arbor Michigan. 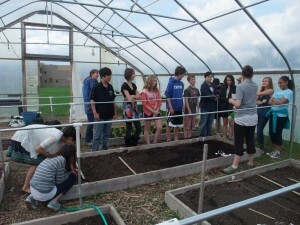 The greenhouse at Tappan Middle School is a foundational resource for district-wide education programming and a unique school resource in all of Washtenaw County. The flagship activity at Tappan is an after-school cooking and gardening youth enrichment program put on by their Food and Garden Club. Over the years the club has nurtured awareness of food culture and connected hundreds of students to the sources of their food. Some key community impacts of the club are growing and distributing seedlings for school gardens in the district, as well as, the student-run seedling sale, a club fundraiser. In their grant application the school cited that over the last two years the number of AAPS school gardens has almost doubled, and thus the demand for seedlings and schoolyard garden consultation has also increased. To meet these needs, a vibrant Food and Garden Club is now needed more than ever. We want to “go deeper” with consistent outreach to more students, to raise food awareness, conduct early season greenhouse cultivation, and impart hands-on agricultural skills such as seedling distribution, sales and marketing. This entry was posted in gardening, Green Thumb Challenge and tagged Gardener's Supply, Green Thumb Challenge, Green Thumb Challenge Grant, school garden. Bookmark the permalink.